Terry Heffner is an artist with a sewing machine. She creates original cowboy clothing for both men and women and does custom sewing at her shop on Hwy 14 south of Viroqua. 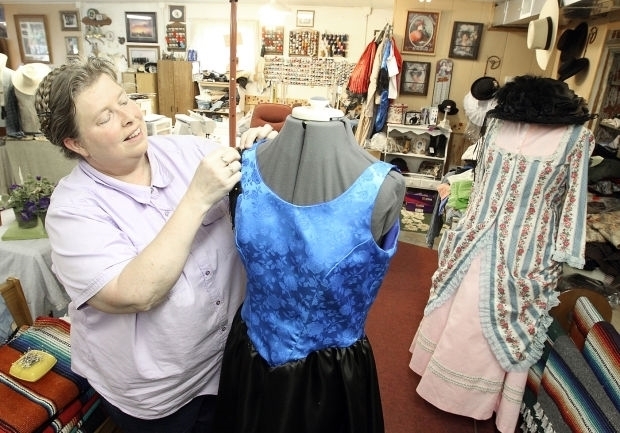 She has sewn for the famous, such as Michael Martin Murphy, and her period correct apparel can be seen on reenactors throughtout the 1800's Boomtown at Viroqua's Wild West Days. "I enjoy sewing. I do enjoy it all," Heffner said. "I did a little quilting when I was young but God made a sewing machine, and I use it." Heffner began sewing for people some 30 years ago and got her start in period apparel after making a Civil War dress for a cousin's wedding. She continued making Civil War-era clothing for reenactors and added the 1880's when approached by Vernon County cowboys. She has since perfected vests, dusters, western shirts and polonaise dresses, and Heffner can make any outfit seen in a Western movie. Her work can be seen on Murphey's website and was used by former Wisconsin State Sen. Brian Rude to tout the state Sesquicentenial. "It takes a day to a day and a half (to make an outfit), but then you have to trick it out," Haffner said. "In the 1880's, they used everything but the kitchen sink - lace trim, all the bells and whistles." To customize her creations and keep them authentic, Heffner peruses fabric stores and look for proper materials - cottons, silks, satins and wools. It is all part of what keeps her customers coming back. In addition, they can bring her a photo, and she can recreate what they've seen.